Shayanfar, Nima, Derhami, Vali. (1393). An Intelligent News Based Decision Support System for Trading Stocks in Tehran Stock Exchange. مجله علمی-پژوهشی رایانش نرم و فناوری اطلاعات, 3(4), 55-61. Nima Shayanfar; Vali Derhami. "An Intelligent News Based Decision Support System for Trading Stocks in Tehran Stock Exchange". مجله علمی-پژوهشی رایانش نرم و فناوری اطلاعات, 3, 4, 1393, 55-61. Shayanfar, Nima, Derhami, Vali. (1393). 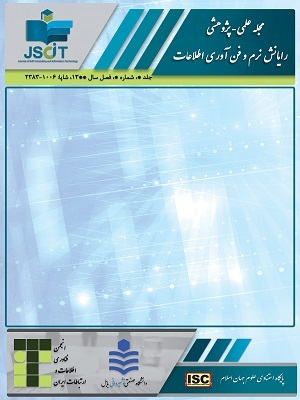 'An Intelligent News Based Decision Support System for Trading Stocks in Tehran Stock Exchange', مجله علمی-پژوهشی رایانش نرم و فناوری اطلاعات, 3(4), pp. 55-61. Shayanfar, Nima, Derhami, Vali. An Intelligent News Based Decision Support System for Trading Stocks in Tehran Stock Exchange. مجله علمی-پژوهشی رایانش نرم و فناوری اطلاعات, 1393; 3(4): 55-61. Stock market is known as a stochastic, nonlinear, and uncertain environment. Hence, decision making in its trading is a challenging task. Indeed, stock markets are influenced by many parameters such as stock market indicators, micro-economic and macro-economic parameters and news articles. The latter is known as one of the effective parameters, attracting analysts’ attention in recent years. If news could be successfully analyzed, predicting the stock market’s reaction to the news would be achievable. This paper proposes a decision support system for trading stocks, based on news in Tehran Stock Exchange. Here, instead of predicting stock price, we predicted the trend of stock price. To this aim, text mining was used to extract several types of features from the news. Afterwards, the most effective features were selected and then provided for Support Vector Machine (SVM) in order to be classified as a positive or negative trend. Based on comparison of several types of features we concluded that the word combination is the best solution for Farsi. The simulation results depicted that stock trend prediction is successful and profitable in many cases. Moreover, due to linguistic similarities between Farsi, Arabic and Urdu, having some powerful stock markets of the world, our proposed algorithm could pave the way for data analysis in those languages.